...These poems open us up to the small, but shining pleasures of our world. I don't know any better strategy to fix the world than that. 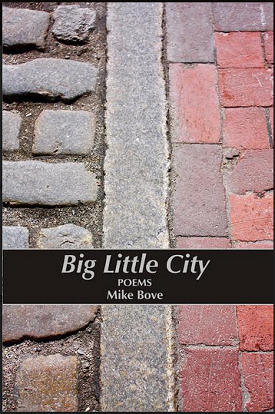 BIG LITTLE CITY is a book for lost souls, not because they can commiserate but because Mike Bove offers them a way to find some light if not the light, a way to keep going, a myriad of moments in which we can both suffer and transcend suffering. city streets and careening over brittle ﬁelds. and the papers urge care in the choice of gloves.